Currently on display in our cafe gallery is the work of Isabelle Lafrenière. Much of Isabelle’s work is mixed media – acrylic paint combined with felt to create visually interesting and thought provoking subject matter. Isabelle will be giving an artist talk on Thursday,\ August 6th proceeding the Cafe Performance. 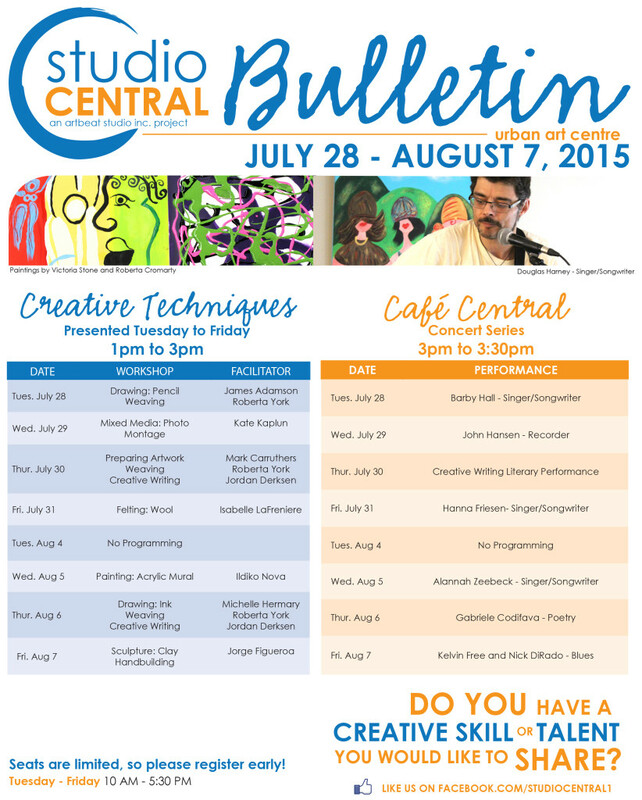 From Saturday August 1 thru to Tuesday August 4th Studio Central will be closed. We will resume regular office hours Wednesday August 5, 2015. We hope everyone enjoys the August Long Weekend. We invite you to come lease make sure to read Kaleidoscope – an online zine of poetry. To read today’s latest poems visit – http://artbeatstudio.ca/kaleidoscope-online/. The Facilitator’s Master Class, Performance Rehearsal and Saturday Self Directed Studio will resume in September. Please call 204 -943-8290 to register. We look forward to seeing you!